The instant hand warmer heat pack is a small 3x5 reusable instant hand warmer that produces substantial heat. This instant heat pack is designed to replace your instant hand warmer that you normally use and throw away. 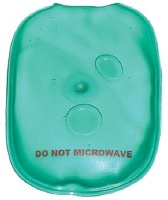 This reusable hand warmer can, also, be used as a "hot rock" replacement in massage therapy.